A new service called “Credit Sesame” gives you access to a monthly updated free credit score based on credit profile information pulled from credit bureau Experian, the very same company behind FreeCreditScore.com. Out of curiosity, I decided to sign up for Credit Sesame – they ask quite a few personal questions, including home address and annual household income, but alas, I continued. They then ask for your social security number, which is used to pull credit information from Experian (this is standard practice, so don’t freak out). Credit Sesame is a safe, well-known company. After that, you must answer a few questions about what may appear on your credit report to verify your identity. Again, standard business. Once registered, Credit Sesame provides you with your credit score instantly, along with your monthly liabilities, which is the combined minimum monthly payments for all your credit card debt and loans (auto leases, mortgages, etc) that appear on your credit report. While this sounds pretty cool, keep in mind that Credit Sesame uses “Experian’s National Equivalency Score,” which is not a FICO score. And its scoring range differs from that of the FICO score range, which ranges from 300-850. It’s not far off though, at 360-840. These types of credit scores can definitely point you in the right direction in terms of what your FICO scores will be, and because they’re free and don’t require a credit card to sign up, they can be quite handy. As you can see, my credit score took a hit (because I had recently charged quite a bit on my credit card after purchasing a home.) But over time, it will climb back up to excellent status. You can also see where you “stack up” against your peers. I’m still slightly better than like consumers, despite my recent drop. One downside to Credit Sesame is that they do not provide a credit report with payment information and tradeline activity, so it’s a bit limited. They only give you bits and pieces, such as monthly payments on outstanding credit lines, total balances, and your debt-to-income ratio. In other words, it’s certainly no substitute for a full-blown credit report. The good news is that the credit pull is a soft one, meaning it will not hurt your credit score (since you’re not applying for a loan or any other type of credit). You’re merely seeing where you stand credit score wise, which will never count against you. They also provide your credit usage, which is the amount of your revolving credit currently in use. The lower the percentage the better if you want a good credit score. As you can see, mine was a paltry 11%, which should put me all the way on the good/excellent side of things, and certainly better than my peers, as seen in the image. 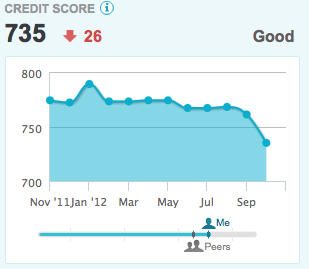 But because of recent credit inquiries and larger balances than I normally carry, my credit score took a hit. 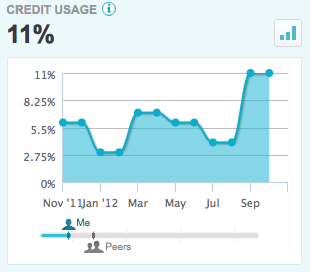 See how my usage rose relatively dramatically from its normal 3-5% level. That will ding your credit score short-term, and long-term if you don’t pay it off. All that said, Credit Sesame provides plenty of useful tips to help you better understand how a credit score is calculated and how it can affect your finances. Think of it as a free educational tool that can actually save you money. Credit Sesame recently launched so-called “premium services” to flank their standard offerings, including the ability to refresh your credit score on a daily basis or take out a $1 million identity theft insurance policy. The new services range in price from $9.95 per month to $14.95 per month, depending on what you elect to receive. The free version of Credit Sesame only updates credit scores once a month, though it does provide monitoring and analysis, along with some limited credit report information. However, if you want a fully downloadable copy of your credit report delivered monthly, or full-on identity protection, you’ll need to shell out some cash. For the record, Credit Sesame offers all this information in the hopes you’ll take advantage of tailored offers, such as balance transfer credit cards , mortgage refinancing, and other debt restructuring products (similar to Credit Karma). You don’t need to take them up on any of the offers or purchase anything to participate, so all in all, it’s a good way to see your credit score for free without a credit card. And the fact that it updates monthly is also a plus, allowing you to monitor your credit score with at least one of the three major credit bureaus for free. If you’re interested in Credit Sesame, you can sign up for free on their site. I don’t mind getting monthly updates from them. In a way, I actually like it because it works as a free credit monitoring program in case anything crazy happens (identity theft, big credit score drop, etc.) and I’m not readily aware of it. So far, Credit Sesame has been pretty reliable, providing credit score updates that match up with the real thing, if perhaps a few points different. Tip: If you want to see all 3 credit bureau credit scores free of charge, along with all your credit report information, you’ll need to find a different service. There are plenty out there, so just search around until you find a reputable company. But beware, most are limited free trials that require your credit card info so they can begin charging you once the trial ends. Next Next post: What Credit Card Limit Can I Get?